There are several artists called 'Kent': 1. 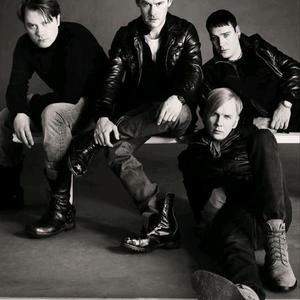 Kent is a Swedish alternative rock band founded in Eskilstuna in 1990, consisting of Joakim Berg (vocals/rhythm guitar) Martin Sk?ld (bass/keyboards) Markus Mustonen (drums) & Sami Sirvi? (lead guitar). Since the mid-1990s, it has established itself as one of the most successful groups in Scandinavia. With more than 1.5 million albums sold, Kent has several times been given the epithet "Sweden's biggest rock band"
1. Kent is a Swedish alternative rock band founded in Eskilstuna in 1990, consisting of Joakim Berg (vocals/rhythm guitar) Martin Sk?ld (bass/keyboards) Markus Mustonen (drums) & Sami Sirvi? (lead guitar). Since the mid-1990s, it has established itself as one of the most successful groups in Scandinavia. With more than 1.5 million albums sold, Kent has several times been given the epithet "Sweden's biggest rock band"
In the band's logotype, the 'k' is lower-case using the Avant Garde fonttype. Kent have had several big Swedish radio hits since the breakthrough single ?Kr?m (s? n?ra f?r ingen g?)?. As of 2010, they are probably the most popular rock band in Sweden, but are more or less unknown outside Scandinavia. They have also tried an international career with English versions of the albums ?Isola? and ?Hagnesta Hill? Only one year after, in 1996, Kent released Verkligen (Really). Guitarist Martin Roos had left the band for his career at Kent's record company BMG, but has since become the band's manager. The pre-release single "Kr?m (S? n?ra f?r ingen g?)" immediately became a radio hit and gained Kent some serious fame for the first time. Two more singles were issued, "Gravitation" and "Halka" - The latter one later to be hated with a passion by the group. Musically, the album was slower with less distortion and more emotion. A Japanese release of "Verkligen" featured the group's first English-language song, an altered version of "Kr?m (S? n?ra f?r ingen g?)" entitled "What It Feels Like". In 1997 Kent released Isola. Guitarist Harri M?nty had joined the group since Verkligen. Verkligen had been heavily toured, gaining some reputation for Kent. The pre-release single, "Om du var h?r" (If You Were Here), became a hit as would the second single, "Saker man ser" (Things You See). Musically the album changed a lot from Verkligen, going a lot in the direction of slower, more thoughtful songs with more emotion. The last song on the album, the 7 minute, 47 second-long "747", with a characteristic keyboard riff and a long instrumental outro, became the band's closer for every show for the next 8 years, and won numerous best-song polls on Kent's website. It was also released as a single, cut down to four minutes and with an added short chorus. In 1998, what many in Sweden had been asking for became reality when Kent released an English version of Isola, featuring an extra song only available on the English version, "Velvet". Kent embarked on two accompanying US tours to promote the album. The first was in support of fellow Swedes, The Cardigans, during which they highlighted new song, "Protection", and the second was a double-bill with American band, Papa Vegas. The band would close the shows for the second leg of the tour with what they described as their "only cover song", a version of Depeche Mode's classic single, "Stripped". Singles were released in various territories for three of the album's songs, "If You Were Here", "Things She Said" and "747" (featuring the English version of "Kr?m", entitled "What It Feels Like"). The English version of the album was initially not meant to be released in Sweden, but public demand was too great. The English version sold poorly outside of Scandinavia. In 1999, Kent released Hagnesta Hill, named after Hagnestahill, a part of Eskilstuna where the band had had their first studio. The first, pre-release single, "Musik non stop" (Music Non Stop), a disco-rock song, became a huge radio hit and helped bring recognition for this album. The album was, for the most part, faster and less ballad-focused than Isola, and also mildly experimental with drum-machines and electronics. The singer and songwriter of Kent, Jocke Berg, have later complained that he thought the album was too long, thirteen songs spread over one hour. Two more singles were released, the Depeche Mode-esque "En himmelsk drog" (A Heavenly Drug) and the ballad "Kevlarsj?l" (Kevlar Soul). After a long break, Kent started to work on their next full-length in 2002. They reported from the studio that they tried to make an album consisting of 10 singles. The first single - Dom Andra (The Others) became a huge hit on Swedish radio. When the album Vapen & Ammunition ("Guns 'n Ammo") came out, many fans complained that the sound was too produced, poppy and commercial, and too much focused on choruses. Despite this, both next singles, "K?rleken V?ntar" (Love Waits) and "FF" (from the double A-Side FF/VinterNoll2), plus the album track "P?rlor" (Pearls) became huge radio hits, sending this album over 500,000 sales, more than twice as much as any other Kent album to date. An English version of the album was planned ? as can be seen on the tape titled "Guns & Ammunition" in the "Dom Andra" video, but was cancelled, according to the singer: "We decided it was not worth it (releasing the album in English) when we realized we had sat in a tour bus for two long US-tours, and nothing had happened". After taking a one-year timeout, Kent returned to the studio to record their sixth LP in 2005. Studio reports said it would be "A very dark album". The first single released, Max 500, was well-received by both fans and critics and became, as the last three singles had, a radio hit. When the album Du & Jag D?den (You & I Death) was released, it was very well-received and was considered by most fans to be one of their best albums. Two more singles were released, "Palace & Main" and "Den d?da vinkeln" (The Dead Angle) - the last one stirring up some controversy among Kent fans because Kent didn't release any b-sides with it (but still the single has a shorter version of the song). The last track on the album, "Mannen i den vita hatten (16 ?r senare)" (The Man in the White Hat (16 Years Later)) was very well-received and is seen by many fans as Kents' best effort. During late spring 2005 they embarked on "Turn? 19" (Tour 19), doing 12 gigs in Sweden, one in Norway and one in Finland. The concerts took place in huge tents with a capacity of up to 18,000. This was the only tour that followed the release of "Du & jag d?den". During the summer there were rumours about Kent releasing an EP, as they had been spotted in studio and guitarist Sami had said "We might release an EP, but if we do it will only be digitally released". Just one month before the November 2005 release, the "The Hj?rta & Sm?rta EP" (The Heart & Pain EP) was confirmed, as a CD as well as a digital release. It was well received and contained five tracks, "Dom som f?rsvann" (Those Who Disappeared) becoming the radio single and having a video recorded. 9th January 2007 the band announced that guitarist Harri M?nty is leaving the band because of lack of motivation. The band claims they're still friends. 17th October 2007 saw the release of their seventh album named "Tillbaka Till Samtiden" (Back to the Present Age) it was preceeded by the single "Ingenting", exactly one month before the release of the album. The album was well received in media, but many of their older fans critisised the bands new more electronic approach to music. Two more singles were released from the album, "Columbus" and "Generation ex" as well as a free digital download, "Vy fr?n ett luftslott (Punks Jump Up Remix)". The band later released "Vy fr?n ett luftslott (Punks Jump Up Remix)" as a physical one track single due to popular demand. On the 29th of October 2008 Kent released what they described as a "half time summary" of their career, a box entitled "Box 1991-2008". The box contains all of their seven swedish studio albums as well as the 2-disc b-side collection "B-sidor 95-00" and "The Hj?rta & Sm?rta EP". The box also contains 26 bonus songs out of which 15 are previously unreleased and a book with private pictures, an interview made by Jan Gradvall, song lyrics and a tour history. 4. Kent from China, known from, i.e., the song ??? .